Embroidered white pillowcase with a message sewn in your choice of thread colour. Embroidered white pillowcase with a message sewn in your choice of thread colour. Single pillowcase, you choose the fabric style. A stylish original gift for a friend or loved one, great for a birthday, Valentines Day or anniversary gift. The personalisation is embroidered in your choice of thread colour and font style. You can have any name, words or a phrase embroidered up to a maximum of 35 characters including spaces. 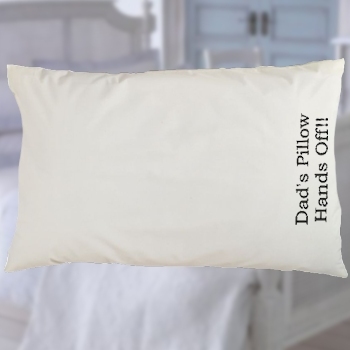 This embroidered pillow case is machine washable and ironable which provides a far better finish than the printed versions available elsewhere. The standard pillowcase measures approx. 50x70cm housewife style. Oxford style has the 2 inch trim around the outer edges. You choose which quality of fabric and style you want. We also offer a cream coloured Egyptian pillowcase. All other styles are white. Make a pair of message pillowcases by adding another to your basket. Please allow approx 24-48 hours for dispatch as these are customised to order.